For the past two weeks, I have been reviewing all fifty of the films to be found in Mill Creek’s Fabulous Forties DVD box set! It’s been four days since I reviewed the 13th film in the set, Scared Stiff, which is probably the longest bloggng break that I’ve ever taken in my life. However, I am proud to say that I am back and ready to review the 37 remaining films! Now, I know what you’re asking. Why, if I am about to review a film from the 1940s, am I sneaking a random Degrassi GIF into this review? Well, unfortunately, the movie that I’m about to review isn’t that interesting and there’s not a whole lot to be said about it. I’ve found some enjoyable and interesting films in the box set — The Black Book, Trapped, the original Jungle Book — but I’ve also found a few that are pretty forgettable. So, why not liven things up with a shout-out to my favorite show? Anyway, the 14th film from The Fabulous Forties Box Set was 1945’s The Stork Club. As for the film’s story — well, this isn’t going to make much sense but here’s what happens. A millionaire named J.B. (charming, Irish-accented Barry Fitzgerald) falls into a pond and nearly drowns. Fortunately, his life is saved by Judy (Betty Hutton). J.B. wants to reward Judy but, for some reason, he doesn’t want her to know that he’s rich. So, with the help of his lawyer (Robert Benchley), he anonymously arranges for Judy to get both a new apartment and an unlimited credit line at all of New York’s best stores! But J.B. also wants to keep an eye on Judy and make sure that she’s happy. But he still doesn’t want her to know that he’s a millionaire or that he’s her benefactor. After he finds out that she’s a hatcheck girl at the Stork Club, he arranges to get hired on as a busboy. However, he gets fired after just one night and, believing him to be poor and homeless, Judy invites him to stay at her new apartment. J.B. agrees and, in the film’s best, non-musical moment, he watches as Judy recklessly spends his money on new clothes. It turns out that Judy thinks that the apartment and the credit line are all gifts from the owner of the Stork Club and she’s offended because she thinks the owner is trying to steal her away from her boyfriend, Danny Wilson (Don DeFore). Danny is a bandleader but he’s been serving in the U.S. Army. When Danny finally returns home, Judy is excited about arranging for him to get an audition to play at the Stork Club. However, Danny is more concerned about the fact that Judy has a mysterious benefactor and that she’s now living in a luxury apartment with a mysterious old man. Could Judy be a kept woman!? Both Judy and J.B. insist that she is not but Danny refuses to believe them because Danny is kind of a jerk. Of course, Danny isn’t meant to be a jerk but, by today’s standards, he’s definitely a jerk. Judy could do so much better! Anyway, The Stork Club was pleasant but not particularly memorable. When it works, it’s largely due to the endless charm of Betty Hutton and Barry Fitzgerald. It may not seem like much today but I’m sure that, for audiences dealing with the contemporary horrors of World War II, The Stork Club presented a nice diversion. Thanks to TCM’s 31 Days of Oscar, I now have several movies on my DVR that I need to watch over the upcoming month. Don’t get me wrong — I’m not complaining. I’m always happy to have any reason to discover (or perhaps even rediscover) a movie. And, being an Oscar junkie, I especially enjoy the opportunity to watch the movies that were nominated in the past and compare them to the movies that have been nominated more recently. 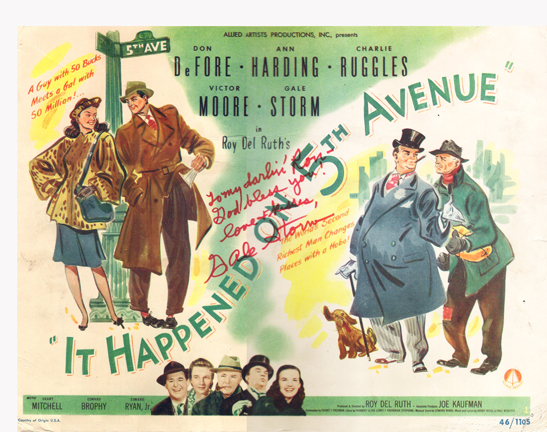 For instance, tonight, I watched The Human Comedy, a film from 1943. Along with being a considerable box office success, The Human Comedy won on Oscar (for Best Story) and was nominated for four others: picture, director (Clarence Brown), actor (Mickey Rooney), and black-and-white cinematography. The Human Comedy was quite a success in 1943 but I imagine that, if it were released today, it would probably be dismissed as being too sentimental. Watching The Human Comedy today is something of a strange experience because it is a film without a hint of cynicism. It deals with serious issues but it does so in such a positive and optimistic manner that, for those of us who are used to films like The Big Short and Spotlight, a bit of an attitude adjustment is necessary before watching. And yet that doesn’t mean that The Human Comedy is a bad film. In fact, I quite enjoyed it. The Human Comedy is a time capsule, a chance to look into the past. It also features a great central performance, one that was quite rightfully nominated for an Oscar. As I watched Mickey Rooney in this film, I started to feel guilty for some of the comments I made when I reviewed Mickey in The Manipulator last October. The Human Comedy opens with an overhead shot of the small town of Ithaca, California. The face of Mr. McCauley (Ray Collins, who you’ll recognize immediately as Boss Jim Gettys from Citizen Kane) suddenly appears in the clouds. Mr. McCauley explains that he’s dead and he’s been dead for quite some time. But he loves Ithaca so much that his spirit still hangs around the town and keeps an eye on his family. Somehow, the use of dead Mr. McCauley as the film’s narrator comes across as being both creepy and silly. But no sooner has Mr. McCauley stopped extolling the virtues of small town life than we see his youngest song, 7 year-old Ulysseus (Jack Jenkins), standing beside a railroad track and watching a train as it rumbles by. Sitting on the cars are a combination of soldiers and hobos. Ulysseus waves at some of the soldiers but none of them wave back. Finally, one man waves back at Ulysseus and calls out, “Going home, I’m going home!” It’s a beautifully shot scene, one that verges on the surreal. That opening pretty much epitomizes the experience of watching The Human Comedy. For every overly sentimental moment, there will be an effective one that will take you by surprise. The end result may be uneven but it’s still undeniably effective. The majority of the film deals with Homer McCauley (Mickey Rooney). Homer may still be in high school but, with his older brother, Marcus (Van Johnson), serving overseas and his father dead, Homer is also the man of the house. Homer not only serves as a role model for Ulysseus but he’s also protector for his sister, Bess (Donna Reed). (At one point in the film, she gets hit on by three soldiers on leave. One of them is played by none other than Robert Mitchum.) In order to bring in extra money for the household, Homer gets a job delivering telegrams. The Human Comedy is an episodic film, full of vignettes of life in Ithaca and Homer growing up. There’s quite a few subplots (along with a lot of speeches about how America is the best country in the world) but, for the most part, the film works best when it concentrates on Homer and Mickey Rooney’s surprisingly subdued lead performance. By today’s standards, it may seem a bit predictable and overly sentimental but it’s also so achingly sincere that you can’t help but appreciate it. The Human Comedy was nominated for best picture but it lost to a somewhat more cynical film about life during World War II, Casablanca.